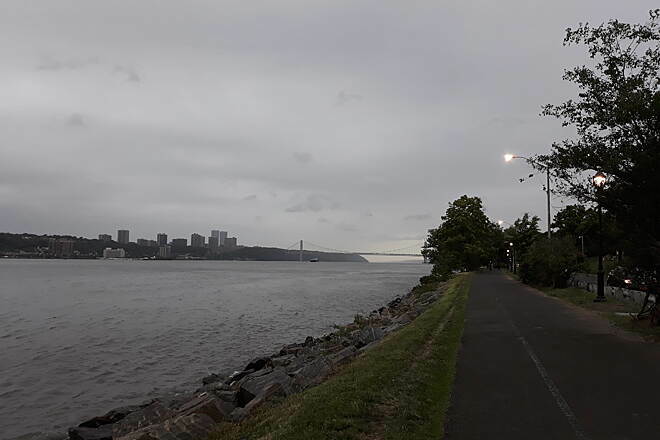 Hudson River Greenway stretches between Battery Park at the southern tip of Manhattan and the Little Red Lighthouse underneath the George Washington Bridge. 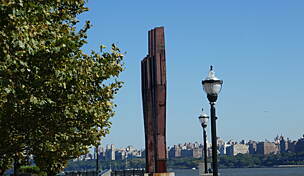 The trail passes through Hudson River Park, Riverside Park South, Riverside Park, and Fort Washington Park. 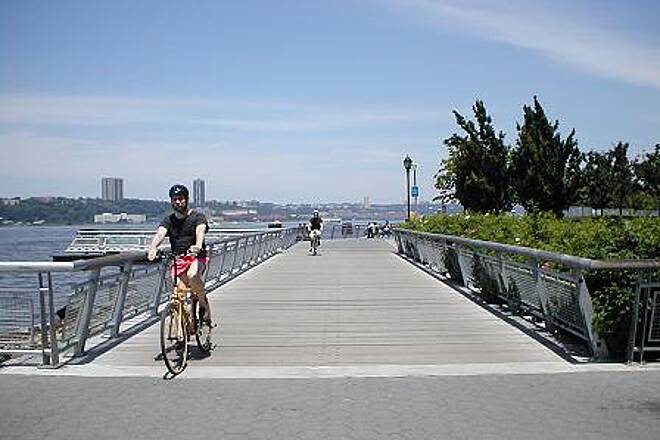 The trail is the western leg of the Manhattan Waterfront Greenway, a bicycle route encircling the island of Manhattan. 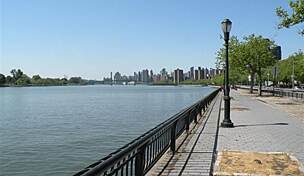 The East River Greenway comprises the eastern leg. 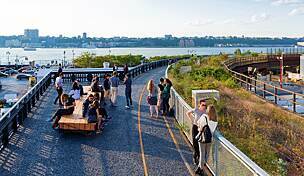 The Hudson River Greenway is part of two much larger projects as well: the Empire State Trail, which will span 750 miles from Manhattan up to Albany and across the state to Buffalo, and the East Coast Greenway, a developing system of connected multi-use trails going all the way from Florida to Maine. As parking is limited in Manhattan, you will most likely want to take public transportation to the trail. Visit the Metropolitan Transportation Authority for information on the local bus and subway systems. Parking is available across the water in New Jersey at Liberty State Park. 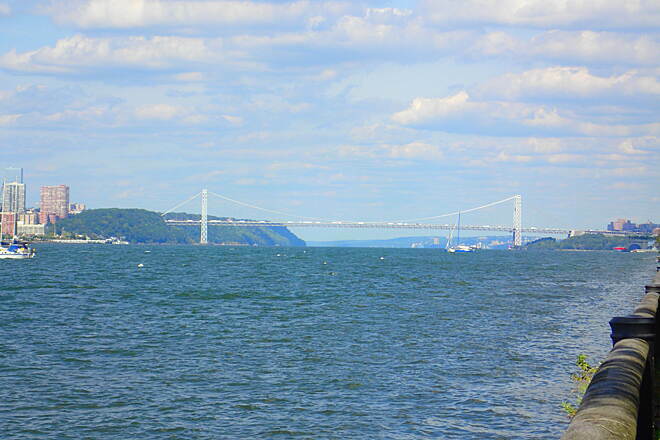 You can take a ferry (for a fee) from there across the Hudson River to Battery Park, where the trail begins. This is a great trail that I will ride some day. I went to a friend's ordination at Riverside Church, and walked from Penn Station to the church. 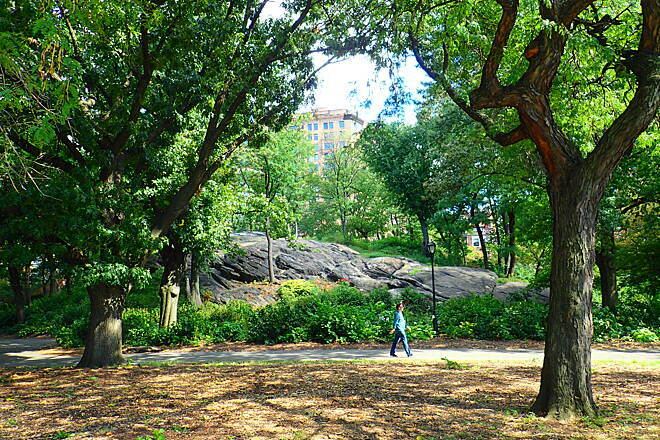 Great views, good trail, restrooms along the way--an urban treasure for New Yorkers. My only complaint is that many of the cyclists were racing, when signs said to go slow. The path is not terribly wide and in many areas must accommodate walkers and the speed of many cyclists was dangerous. That's a fault of the bikers, not the trail. Just be mindful of this if you are a slower rider, riding with children, or walking. I plan to return, and bike on an off peak time for a better experience. I`ve biked the trail several times. From NJ I park for free at Liberty State Park which also offers several miles of trail along the river. Take the yellow liberty ferry across the river, runs every 1/2 hr on the half, great views $7 each way, no charge for bike. Terminal is right on the trail offering clean rest rooms. There are numerous rest rooms and outdoor dining places along the trail. Check out the Fairway Market on the northern section of the trail, like no other grocery store, great food to take out and eat while watching the river traffic. 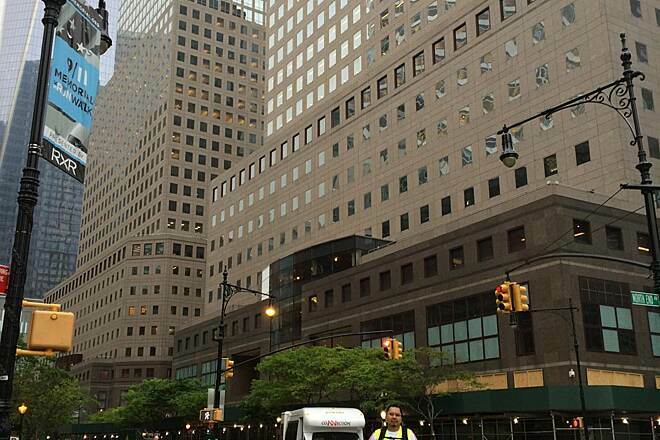 It is not the NYC of years past, very safe and visitor friendly. So, I own a bike and decide to go biking near my sister in NYC. We found a nearby bike store named Tread Bike Shop over on Dyckman St in Washington Heights to rent a bike (fabulous place! Nice bikes great prices!) and the guy helping us, Lance, told us about this trail. Sounded good and was easy to get to on the bikes. Well, what an adventure; it was awesome! Challenging enough to keep you interested yet easy enough that a beginner can do it. It is mostly flat and all paved with a few inclines to get your hamstrings fired up! We had a great day and would certainly do it again. Only NYC mixes people watching (the parks) with boat viewing and tennis matches. Yup, it is a definite favorite route! Does anyone know where car parking in Ft lee is available? I would like to drive vehicle to FT Lee and ride my bicycle across GW Bridge to 46th & 12th Ave. USS Intrepid. Any help would be appreciated. When I was researching how to do this, I had trouble finding the right route. I wanted to minimize the street biking, and other directions had multiple streets to get lost on or to have to fight with cars. This route has a few out-of-the-way streets with very little traffic (that I saw). Warning, though, this isn't a thing for young kids. The Greenway Trail is a bit more crowded than you'd like for a kid, but do-able. The bridge, just don't. So there is a historic park in Fort Lee that doesn't charge for parking during the week, but does on weekends. It's less than a half mile from the bridge entrance. You have to take a sidewalk to get to the bridge. Cross the bridge, no real trouble. Get off the bridge, and there is a descending twist back that lets off on to Cabrini Blvd. Follow signs to make a right for one block. Make a right on 177th to Haven Ave., where you make a left on to Haven. A very short distance down haven, the trail gets off the road on the right hand side. It switches back and forth, there may be some steps, but you go under a bunch of roads. You'll eventually get to Riverside Dr., which you will have to cross. I thought it would have a lot more traffic than it did (I wish you the same). On the other side of Riverside is a set of steps going down, then a tunnel, then a set of steps coming up. It was around there that I got lost, but I was directed the right way by a strange lady who lives in a tarp tent in the forest. I don't normally talk to strange ladies who live in tents, but I didn't think a Manhattan forest would be large enough to be lost in. She directed us left from the top of the stairs. The path turns to dirt after 50 yards. Don't worry, this is Manhattan, where dirt will revert to it's natural state of pavement after not too long. So we went under a bridge on a tight path, but still separated from traffic by a barrier. After that, there is a tunnel just for bike/pedestrians and another long set of stairs. The Lighthouse is a quarter mile from those last stairs. Warning: You're coming back up all those stairs and incline after doing your biking for the day, so keep a reserve of energy for that. On that trip from the Greenway to the GWB, there are no good places to stop. You have to do this, at least once!! This is one of those Bike Trails, even when finished, will NOT be for everyone. However, I believe it is for everyone, at least once. 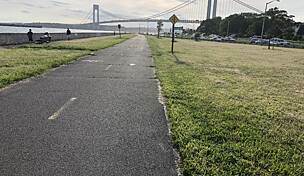 Picture this: a paved bike path hugging the Hudson River spanning almost the entire west side of one of the most popular cities in the world. Towering skyscrapers keep a close eye on you as you watch the passing boats on the river. 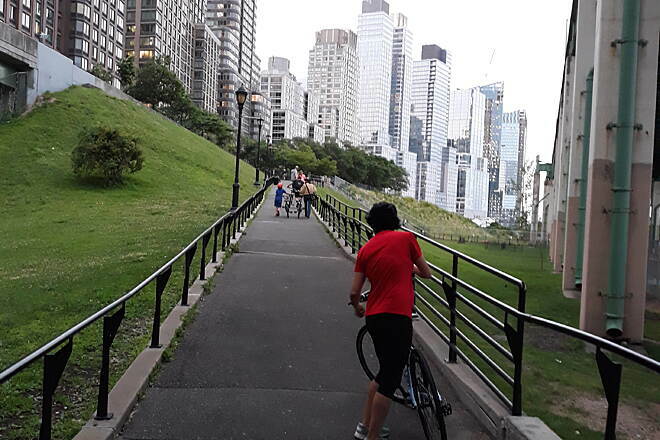 The “Hudson River Greenway” is one of the most popular paths in the Country, however to be fair, that is because of the sheer number of users who have this accessible to them. Locals have a love/hate relationship with the Trail, (which I’ll explain shortly). Out-of-towners however are spellbound. 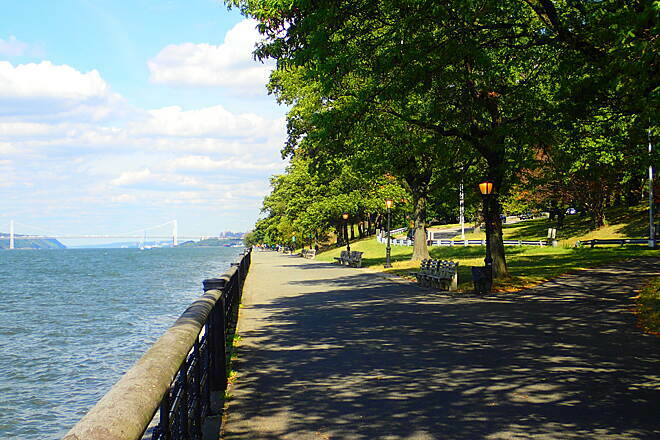 You can either end, or begin, at Battery Park, the southern tip of Manhattan. 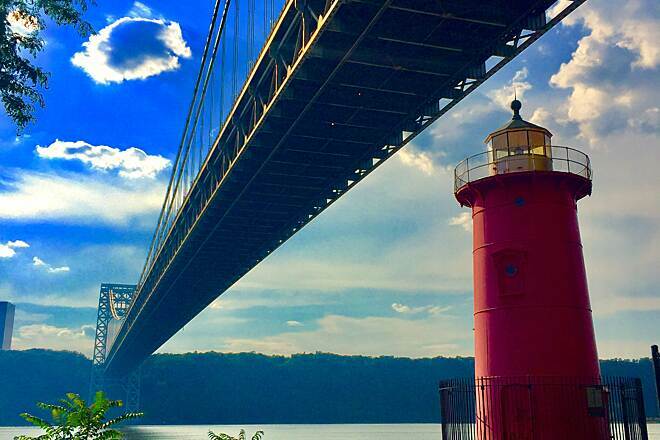 The eleven mile +/- journey takes you to the George Washington Bridge where the little red Lighthouse stands in its shadows. On a side note it was sad to see the Island’s last remaining lighthouse locked up and not accessible to the public. Let’s talk about the good, the bad, and the ugly of this famous Trail. The good is, for the most part, the trail is paved and offers enough eye candy to keep you interested for however long you care to bike. You will snake through/by four Parks offering lots of beautiful options to capture a photo or take a break. 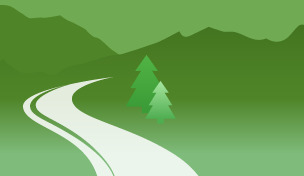 If you have spent your time on wooded trails this is a welcome change! Get ready for something very different and very memorable! The bad, well, can be very bad. For me some ingredients of a “good trail” must be consistency, safety, accessibility from many locations, and offer parking, restrooms and water. A better trail needs to have all of the above and be wide enough to accommodate everyone, or have a separation for walkers and bikers. This is where this Trail falls short with some riders. 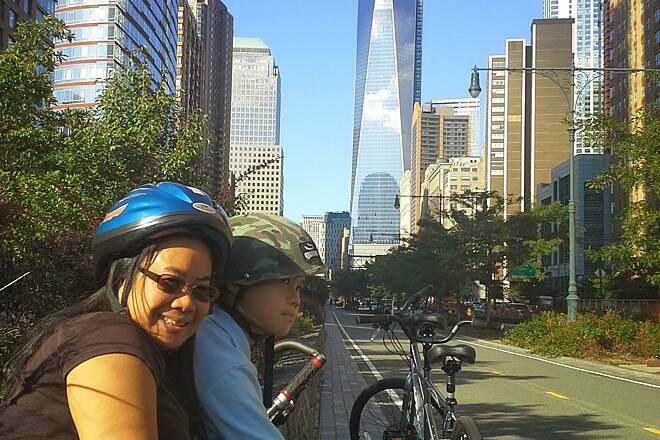 We did the trail during New York’s “Summer Streets”. This is one of about three days a year when selected streets are closed to vehicles and open to cyclists. That was a treat within itself. 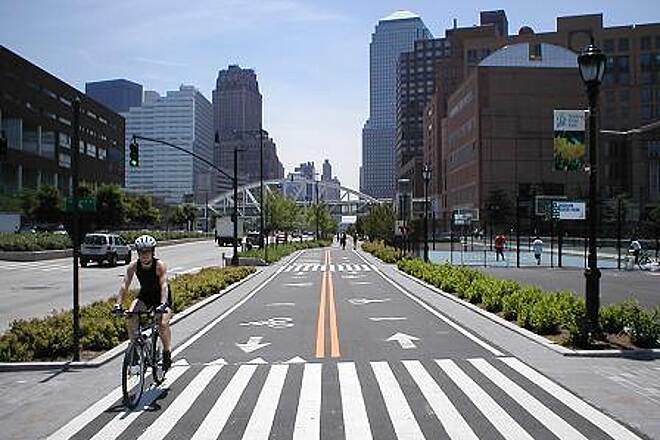 Imagine biking down the Center of New York with no cars honking!! 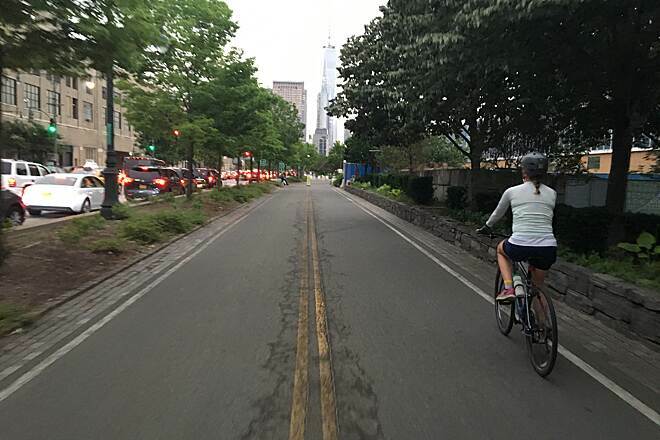 I bring this up because it was for this reason, (Summer Streets), I found the “Hudson River Greenway” was extremely light in terms of traffic the day we explored it. People who might possibly have been on the Greenway were buzzing around the streets of Manhattan! I understand the Greenway, on a normal summer weekend, can be dangerously crowded. The dangers are walkers, skateboarders and cyclists all using the path but not being considerate with one another. Walkers will be playing with their phones walking two abreast. Unfortunately bikers can be just as much to blame as some are practicing for the Tour as they fly by at unsafe speeds while others are riding two abreast and not moving over when the need arises. Another ingredient in the mix is the City Bike program, which may be an awesome venture, however does cause a potential risk as some people renting bikes haven’t been on one since they had training wheels. It’s New York which means parking your car can be a challenge, but not impossible. Of course, you can find parking somewhere along this eleven mile trail however, from my experience, finding one of the few entrances to the trail may be tough. If you are a Local you have come to know where you can enter the Trail. If you are visiting may I suggest you print a map before you arrive. Signs are simply non-existent. It always amazes me how we find the funds to create a half way descent Path yet we don’t have the money to post clear signage so all may enjoy. At one point we attempted to find the Trail from Central Park and even a Local explained it “was involved”. Coming from out of town we walked our bikes on the Staten Island Ferry and walked them off at Battery Park. There is street parking in Staten Island close to the Ferry. We parked at the Ferry Terminal for $8. The Ferry is still free and runs all day. I noticed only one restroom on the trail, however again I’m sure there are many located in the Parks. I did not see any place to fill water bottles. The “ugly” is really not ugly, but it should be noted this path is not consistent. From the pictures it appears to be a paved, lined, flat, landscaped work of art. Unfortunately those pictures are of the sections of the Path that are completed. You will quickly find yourself at times on narrow, unsigned segments that will have you wondering if you lost your way. It should be noted there is nothing here worth worrying about because in New York you can always “follow the crowd”, however in my opinion, it was worth mentioning. Enjoy the Ride, it Goes by Fast! From Fort Lee, across the GWB, down the West Side Highway Trail, pass thru Battery Park, South Street Seaport, onward to the Brooklyn Bridge: cross bridge and began to head back over the bridge to the Staten Island Ferry Terminal for a short ferry ride to Staten Island; off the ferry in Staten Island, up bay Street to South Beach and Verrazano narrows Bridge...end point. Best during non peak days and least congestion after summer or early spring...fall is another option. This was a very enjoyable ride. I rode from Ft. Lee, over the GWB, then down the trail to Battery Park & back. I got a little confused trying to get back to the GWB, but ended up riding up to 181st St to Fort Washington back to the bridge. Beautiful city riding, with lots of other riders, skaters and joggers. Can't wait to do it again. We parked at the very north end tip of Manhatten and rode down to Battery Park along the west side of the city. There we saw a map by the bike rental area showing the path continues back up the east side-along the East River. Prior reviews (RtoT) indicated the trail was complete. Looked good so we decided to try it. The trail was obstructed with construction barrels and horrible walking crowds at the south end. It abruptly ended without warning just as we were entering the area east of the Harlem neighborhood. Had to carry our bikes up onto expressway overpasses. Once on city streets we found a group of police officers who told us the trail was closed north of that point. They also said we would have to ride through Harlem and not to stop for anything. We were now obligated to ride city streets through Harlem to get back. It was scary. Our group consisted of 2 girls and two guys (my husband is a cop) We were verbally acosted with sexual comments as we drove through groups of men hanging out in the streets.We stopped for nothing-inclulding street signs. We arrived safely back at the car but a WORD OF WARNING. Don't ride the east side of Manhatten for a year or two. Whoever runs the bike rental in Battery Park should be providing this information to all bike renters and as a matter of safety it should be noted on the public map at the site. 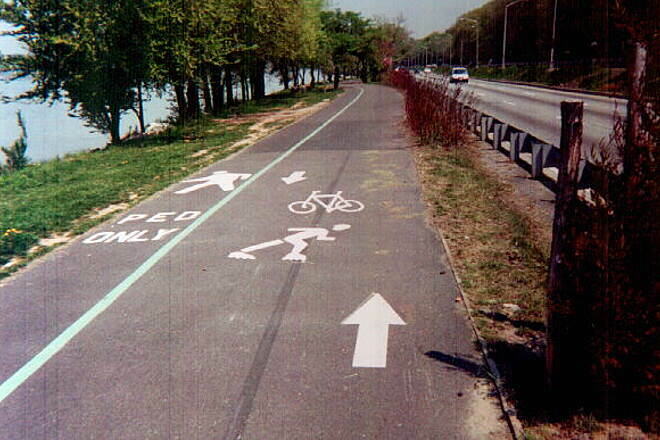 I started my ride on this trail at Fort Lee NJ. From there I rode across the George Wahington bridge, picked up the trail and rode to the Brooklyn bridge and back for about a 30 mile ride. The pedestrian path at the NYC end of the bridge is very narrow and pretty steep. Also from the steet level down to the trail at the red lighthouse is very steep. From here on the trail was level and very easy peddlilng. Traffic was light at the north end, but very heavy the further south you go. If you like big city riding, this trail is for you. Except for the steep parts at the bridge, this is a very enjoyable ride. 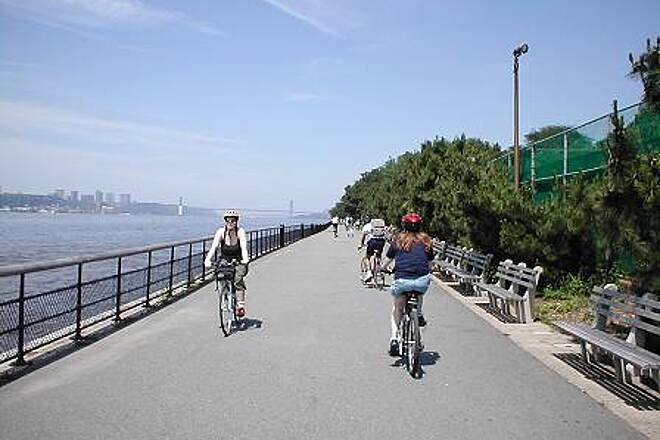 "Easily the best thing to happen to NYC parks in my lifetime the Hudson River Park and the bike trail included is a gem beyond measure. 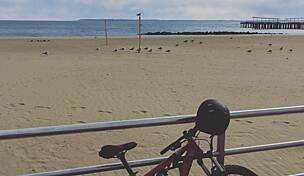 Great surfaces (flat, smooth, purpose-built bike path), peerless views and Manhattan location. 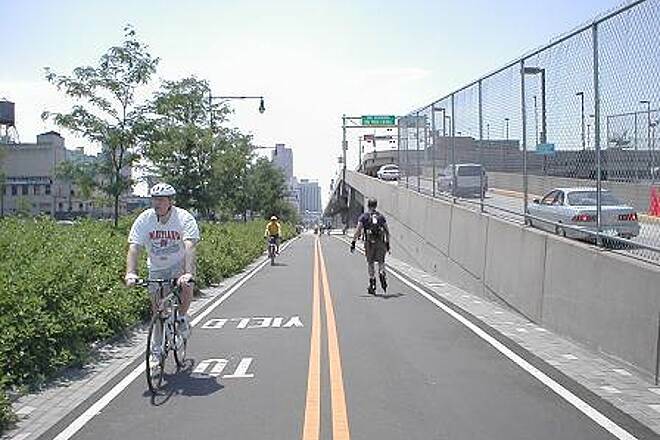 Yes the Battery to 125th is a great delight but now as improvements are made cyclists can enjoy Passing the North River Plant, and going on up to Dyckman Street if you are not afraid of a couple of inclines. 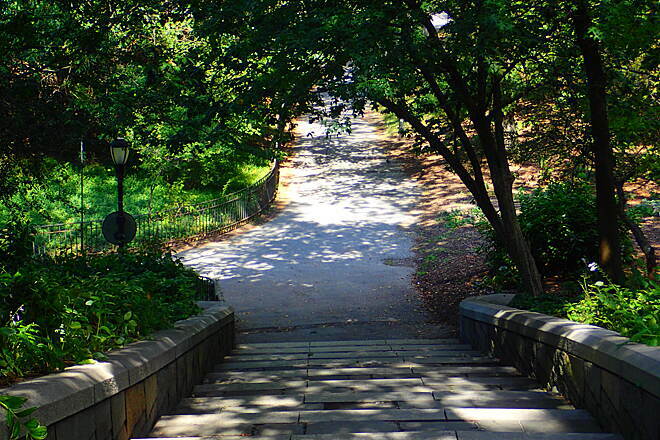 Inwood Park, the Greek Temple and the hidden details of Riverside Drive will make it all worth while. And then go East for the East Side Bike trail..."
If one is lucky enough to have the time, I recommend the following bike trip: Stay overnight in New York City near or in Battery Park. 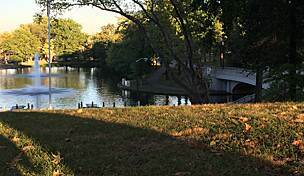 There are beautiful grounds by the Embassy Suites that are right on the riverfront. 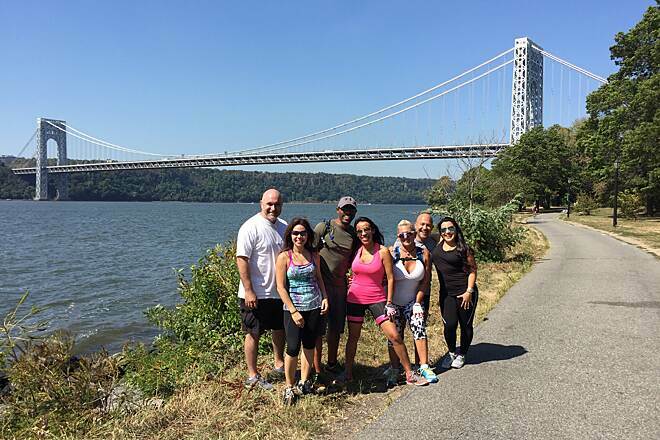 Take the HRT up to the George Washington Bridge and cross the bridge using the bike path. Then take 9W North (on-road route). 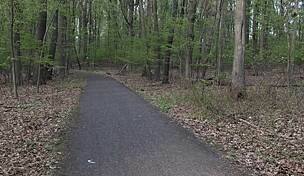 To the next trail in Tappan, New Jersey, see this Web site for details. In Piermont take the rail-trail to South Nyack. Then meander through the Nyack shops, etc. Take the Hook Mountain Trail to Haverstraw. 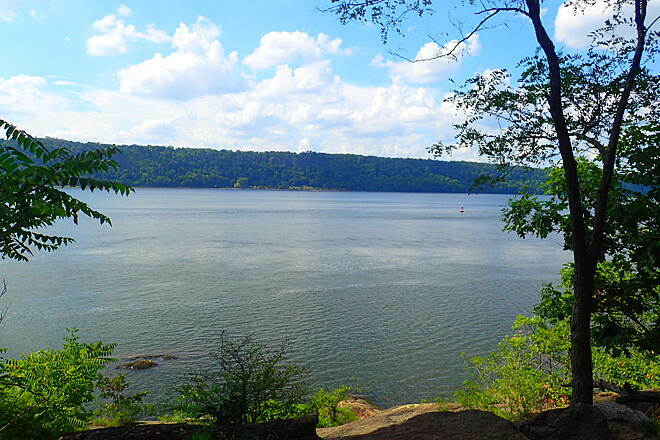 Follow the Haverstraw Waterfront (on-road route) to Stony Point, then take side roads, or 9W, to Bear Mountain. 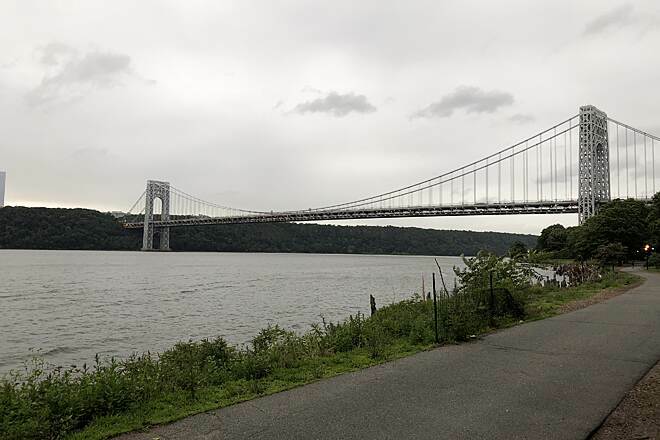 Take Bear Mountain Bridge (bike path) to 9A North (some trails criss-cross this road. 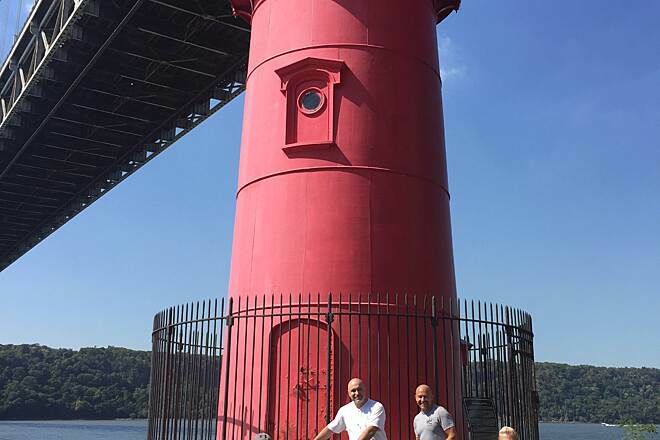 Go to the Newburgh Beacon Bridge. There is a three-mile bike/walking path attached. Take side roads south to Cornwall, then Route 218 to West Point. You'll end up back in Bear Mountain. You can return to New York City the same way. The total trip is maybe 150-miles. Consider hotels in West Point, NY, or Newburgh. Or even B&Bs. It makes for a great weekend of bike trails, rails-to-trails, small roads, and riverfront towns." Pedestrian walkways and resting areas and parks are being finished on former piers. The Hudson River Greenway keeps getting better all the time. 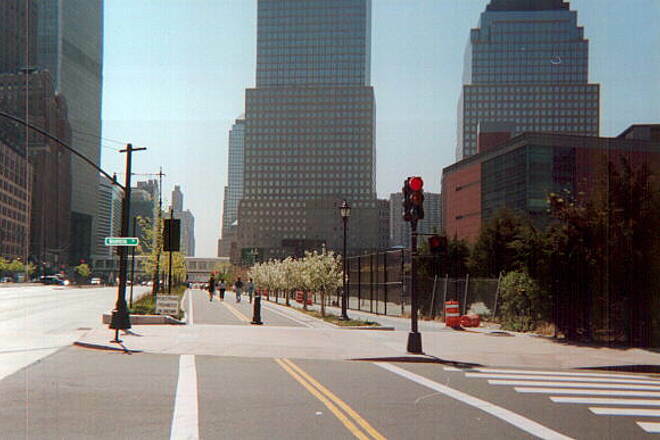 The Hudson River Greenway is now finished completely since 9/11. The segment near the WTC site is done and the trail now goes from 181st Street (and beyond the George Washington Bridge) to Battery Park. It becomes the East River greenway from here. 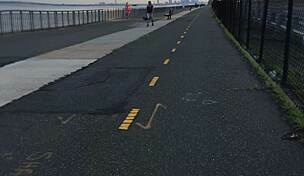 It goes around Battery Park and has an on road segment by the Staten Island Ferry and then converts to a sidewalk path for a while before becoming two lanes: one for pedestrians and one for bikes. It passes piers and has a lot of historical markers. It is steady going until around 34th Street where there is a fence in front of you and the waterfront and the FDR takes over. From here it's an on-street route with hardly any signs as of yet. You have to pick up a 2003 NYC cycling map to see the on-street routes in the five boroughs as well as all the greenways. 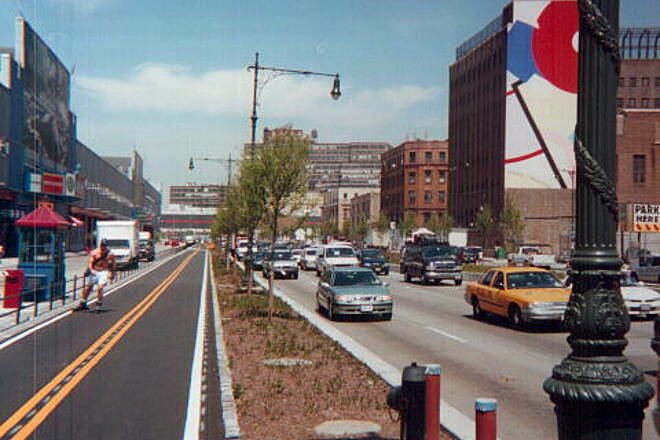 The greenway picks up around 63rd Street and continues until the Triborough Bridge entrance around 125th Street. That bridge is bike friendly as are all the East River bridges. The greenway around the Manhattan is about 90% complete. From 125th Street as per the cycling map it is expected to connect diagonally through Dyckman Street and then connect to the West Side of Manhattan near the little red lighthouse under the George Washington Bridge. I'm guessing total mileage for both the Hudson River and the East River Greenways is about 25-30 miles. 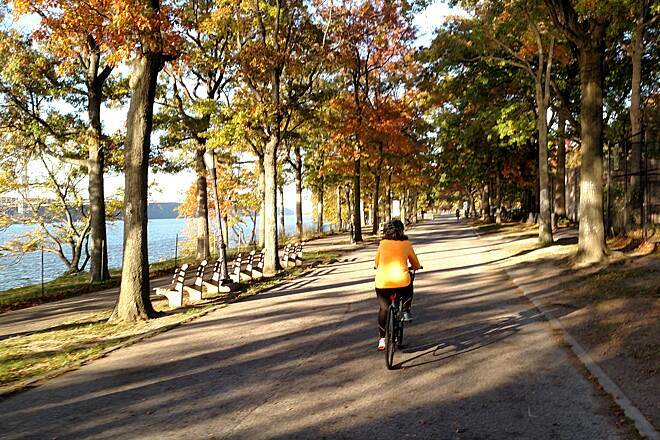 "There is no other city like New York, and there is probably no other trail like the Hudson River Greenway. Easy, safe cycling amidst the controlled urban chaos of New York. I am involved in building trails in our small city; therefore, I cannot imagine the expense and difficulties involved in this project. Congratulations to those with the vision. Don't visit New York without taking your bike!" "The day we chose to be on this well paved and maintained Greenway was a sunny Saturday. Despite the crowds on the trail it was an enjoyable experience. 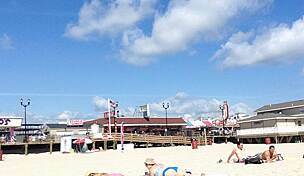 We started from 34th Street and headed downtown after getting off from the ferry that took us from Imperial Port, NJ. We were dodging pedestrians, joggers, rollar bladders and other bikers along the way and at some points and it was a bit frustrating. 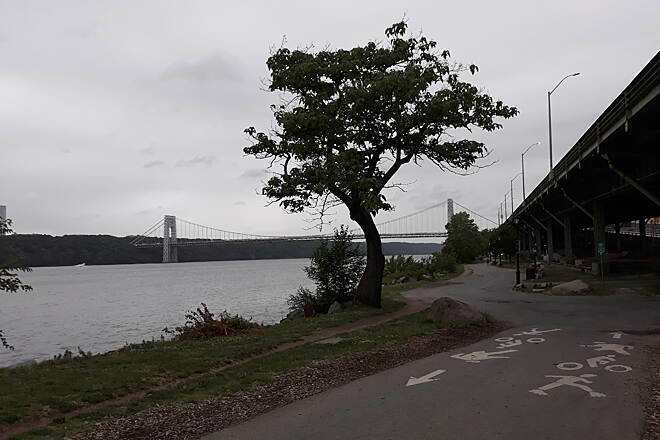 However this was more than made up by the spectabular scenic view of the Hudson, and its gentle breeze that accompanied us through most of the ride. The Greenway passes several ports, museums, helicopter landing pads, some retail stores. The way is equipped with many traffic lights which was new for us bikers who are so used to riding on railroad trails. Crossing the road wasn't fun knowing how New Yorkers drive sometimes. We took a detour through the public walkway next to the what appears to be multi-apartment complexes. This walk way, shared by many pedestrian turned out to be a pleasant surprise. It was like riding through a beautiful private park. Across the Hudson we saw the Statue of Liberty. We eventually reached Battery Park and witness the Eternal Flame. When we were riding back up we foundout this Greenway can be entered through Manhattan Westside 88th Street. We could have avoided paying $12 round trip/person for the ferry and $6 for parking." The Big Apple's Best New Asset! 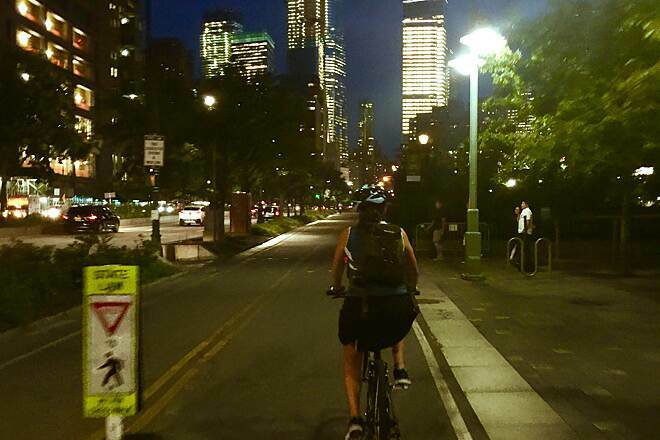 "This trail offers a unique way for bicyclists to travel in busy Manhattan without the noise and dangers associated with motor vehicles. The best portion of this route is from 80th Street or so south to Battery Park. 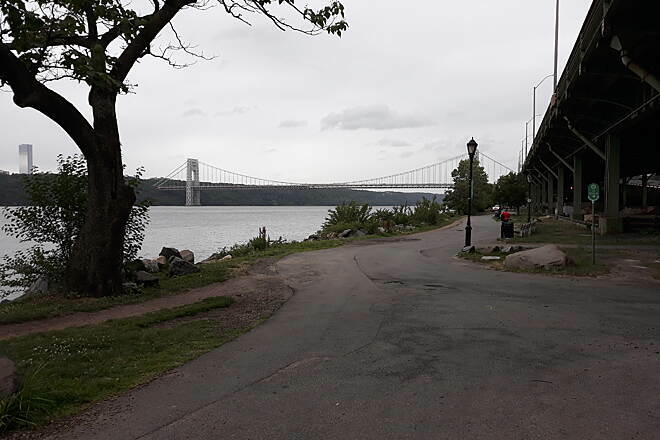 A great place to park and begin is at 96th Street and the Henry Hudson Drive. There's currently a detour in place that will take you through bustling Riverside Park, but once you get back on the Greenway a little north of 80th Street you'll have a very nice ride south. Sights along the route include the 79th Street Boat Basin, a passenger ship terminal, the Intrepid Floating Museum, Chelsea Piers, the former World Trade Center Site, Battery Park and the Staten Island Ferry. On good weather days the Greenway is filled with in-line skaters, walkers and bikers. If you’re single, it’s a great meeting spot. 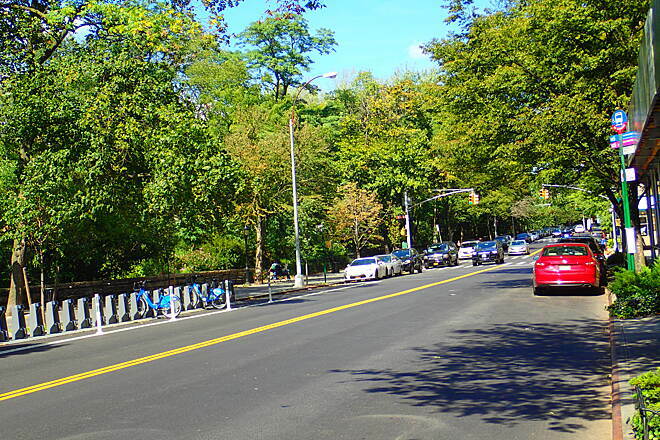 The Greenway segment from 96th Street to 125th Street is immediately adjacent to the Henry Hudson Parkway. This section is very noisy and frequently covered with broken glass (a result of bottles tossed from passing automobiles). A detour along local streets is in place from 125th Street until the Greenway resumes at approximately 135th Street. As of this date, I have not yet biked north of 125th Street. 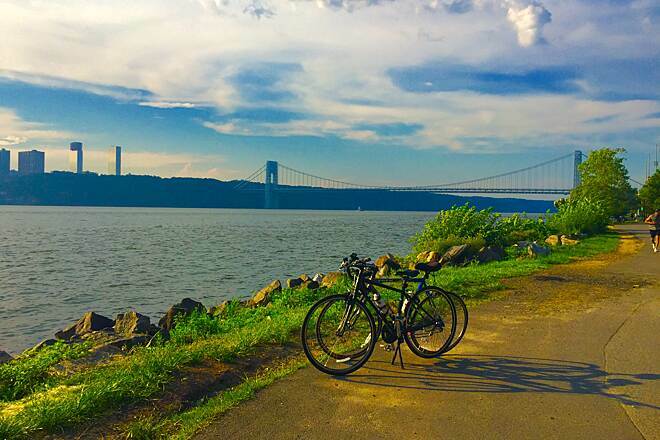 If you’re visiting the Big Apple, bring your bike. The trail is totally flat (at sea level) and nicely paved.